The Senate Intelligence Committee on Wednesday endorsed the findings of the intelligence community's report on Russia's 2016 election interference, and its findings that Russian President Vladimir Putin worked to aid President Donald Trump and hurt Hillary Clinton's White House bid. In a pair of statements following the meeting, the Republican and Democrat who lead the Senate Intelligence Committee say they have no reason to question the intelligence community's January 2017 report and its conclusions, splitting with House Republicans' recent report disputing the intelligence community's conclusion that Putin favored Trump over Clinton. "Committee staff have spent 14 months reviewing the sources, tradecraft, and analytic work, and we see no reason to dispute the conclusions," Chairman Richard Burr said in a statement. The Senate Intelligence Committee invited four former intelligence community leaders to testify in a closed-door classified hearing about the analysis compiled during the Obama administration, as part of its ongoing Russia investigation. Former Director of National Intelligence James Clapper, former CIA Director John Brennan and former National Security Agency Director Admiral Mike Rogers appeared on Capitol Hill Wednesday for the classified hearing. Comey, who was fired by Trump last year and recently released a book about leadership that described his encounters with the president and likened Trump to a mafia boss seeking loyalty, was also invited to testify but was not expected to appear, according to the committee aide. In March, the Senate Intelligence Committee released election security policy recommendations, while last week it released an interim report on election security. 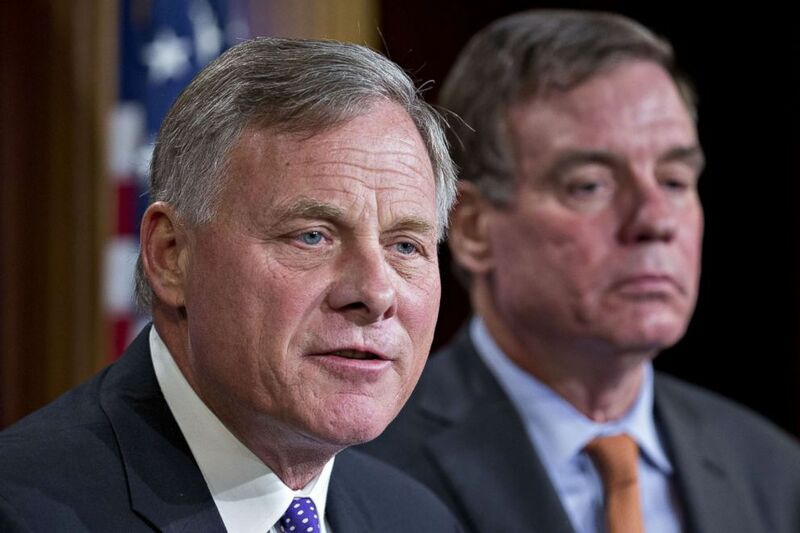 Senator Richard Burr, chairman of the Senate Intelligence Committee, with ranking member Senator Mark Warner during a news conference in Washington, D.C., Oct. 4, 2017. That report concluded that Russian-linked hackers targeted election systems in at least 18 states. The committee found no evidence that any voters were changed as a result of Russian activities but determined that hackers were in a position to alter or delete voter registration data in a few states. On Wednesday, following the Senate hearing, Rep. Adam Schiff, D-Calif., the top Democrat on the H0ouse panel, said the House Republicans' conclusion about the IC assessment "now stands in lonely isolation - rejected by the Intelligence Community, by the findings of the Mueller investigation and by Intelligence Committee members in both chambers who have objectively reviewed the facts." While Comey will not appear on Capitol Hill before the Senate, House Republicans have expressed renewed interest in questioning the former FBI director about his interactions with Trump and past congressional testimony following his media blitz. The Justice Department inspector general is expected to release its report into Comey's actions and the FBI's handling of the Clinton email and Trump-Russia investigations in the coming weeks.